Morris Palter and Ensemble 64.8. University of Alaska, Fairbanks. Dr. Morris Palter, graduate of the University of Toronto School of Music, disciple of Steven Schick and currently Assistant Professor of Music at the University of Alaska, Fairbanks flew into Toronto with 3 of his graduate students and presented a concert of music for percussion at the Music Gallery Monday night, 7th of May. I’m not a great fan of music by John Luther Adams (b.1953), but he’s hot now and I suppose I should be happy for him. He has labored in the wilderness, literally, for many years and besides, is a good guy. Years ago I visited him in his rustic, but comfortable cabin in the Bush outside Fairbanks. There are no doubts in my mind about his dedication and honest approach to his music. Adams’. . . and dust rising . . . (1997), a work for four snare drums, needed better orchestration. Morris’ group had little choice here. All the instruments were rented from a local shop and in such cases, one must accept what’s delivered. To my ears, the piece was no more than an exercise in counting. It pales in comparison to James Tenny’s (1935-2006) Crystal Canon from Three Pieces for Drum Quartet (1974). The hit of the show for me was Aphasia (2010) by Mark Applebaum (b.1967). It was performed by Dr. Palter, who from past experience seems to thrive on and enlarge theater pieces. I cannot imagine a better performance of Aphasia. I was enchanted from beginning to end. The audience was small and as usual, no percussion students from the University of Toronto were in attendance. I say as usual because the percussion students at the University of Toronto by tradition don’t attend concerts, even Nexus concerts. I can’t imagine what keeps them away. They are missing opportunities to hear percussion repertoire currently being played throughout North America. As future educators and performers, one would naturally assume an interest, indeed a need, to expand their music minds. The habit carries through beyond graduation. Rarely does one see any Toronto percussionist at percussion music concerts. However, Dan Morphy member of the Torq Percussion Quartet and one of Toronto’s best musicians did attend and we sat together. We hadn’t seen each other in quite some time and it was a pleasure sharing the concert experience with him. The Steve Reich (b.1936) Mallet Quartet was written for Nexus and two other groups in 2009 and given its Canadian premiere in Koerner Hall by Nexus. I attended this performance and came away thinking about Picasso. Towards the end of his life Picasso would hand out favors to almost anyone. He’d scroll something on a restaurant napkin, sign Picasso, and the lucky recipient would go away feeling they’d just inherited a masterpiece. I wondered if Reich was up to the same game. Years ago, Nexus paid quite a bit of money to copy the music of a piece Steve was “writing for us”. This turned out to be Sextet, a work Nexus could never play again at least on the road because it required two extra musicians playing pianos and synthesizers. Now, the Mallet Quartet, a work instantly recognizable as being from the pen of Reich, but from all other points of view, a “toss–off”. A friend told me the middle section was “original”. Yes, but original does not equate with good. One does not always get what one pays for. Nevertheless Ensemble 64.8 played the work with clarity and they’re set up, two marimbas at the back and two vibraphones facing each other at the front worked better in the music Gallery then it did for Nexus at Koerner Hall. 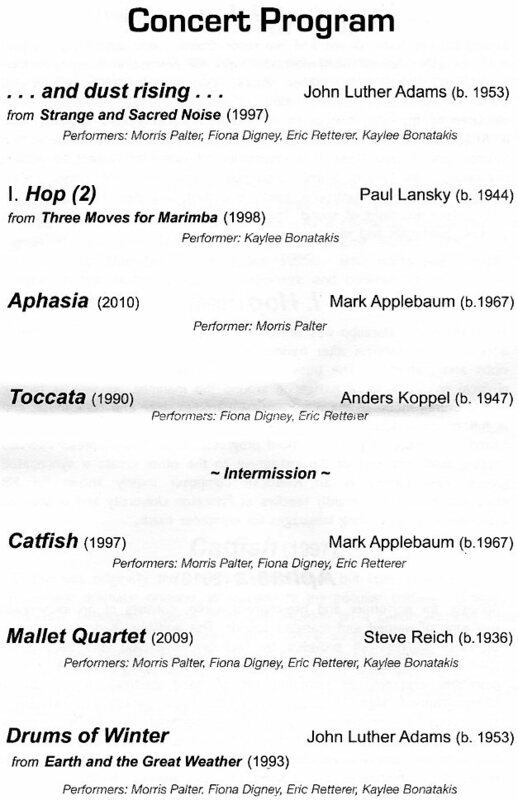 I’ll comment on only one more work, l. Hop (2) from Three Moves for Marimba (1998) by Paul Lansky (b. 1944) and performed by Kaylee Bonatakis. I liked this work. I asked Kaylee how long she’d been playing it because I thought she needed more time with it. Still, everything was there, and, propelled by an occasional bass note, the piece has an infectious swing. After the concert I went to a pub with Ensemble 64.8, Dr. Palter’s sister, mother, father, aunt, and Dan Morphy. This made getting up the next morning a bit difficult, but I had to meet 64.8 for lunch. It was good to hang out with them in the relative quiet of a West Queen Street restaurant. One of the students is from Florida, another from Australia and the third from Fairbanks. Then, they were off to see The Avengers. They are staying around for the Friday and Saturday drumming event in Guelph and will fly home Sunday. I enjoyed their music. Keeping up with Morris is fun. From all indicators, he’s doing good things in Fairbanks, Alaska.